Hyundai’s i20 supermini has been refreshed with a fresh look, while also bringing and a host of additional safety and connectivity features. 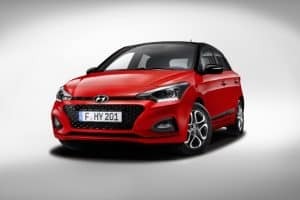 Coming as a five-door hatchback or three-door coupe, the updated i20 will be available with two new petrol engines: a single-litre T-GDI with 100PS, linked to a five speed manual or seven-speed auto gearbox, or an uprated version of the same engine with 120PS and a six-speed manual transmission. As before, the 75PS and 84PS 1.2-litre naturally aspirated petrol complete the i20’s engine range. All i20s will come with the Idle Stop and Go (ISG) system as standard, which automatically switches off the engine when the car comes to a halt in traffic, helping to lower fuel consumption and CO2 emissions. Official fuel consumption figures haven’t been confirmed yet but Hyundai has said that the new T-GDI engine is equipped with a built-in particulate filter to enhance environmental performance, while the whole i20 powertrain line-up is fully compliant with Euro 6d temp regulations. Bizarrely, most of the visual changes have been reserved for the five-door model, which receives a refined front-end with cascading grille, a reworked tailgate which now integrates the license plate, a two-tone roof, and a choice of new colours for even greater personalisation (tomato red, champion blue and clean slate, in addition to the existing colours passion red, sleek silver, stardust grey, polar white and phantom black). The five-door can also come with Hyundai’s Smartsense package, which includes lane departure warning, lane keep assist, autonomous emergency braking and high beam assist.